Our process begins with an initial meeting at your home. At this time we will evaluate the area and discuss scheduling and setting up a second meeting at our showroom. At our second meeting, we will present you with a 3D rendering of your proposed kitchen. 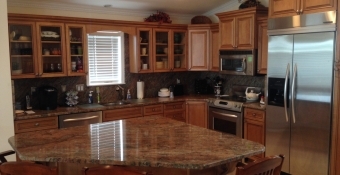 Our state of the art computer software will give you the ability to view different colors and styles of cabinets with the click of a mouse, allowing you to choose a design that fits your needs and personal style. 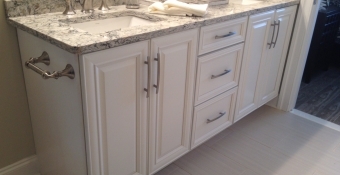 Once a cabinet style and color have been chosen, we can provide you with a full drawer and front door panel upon request. This will give you the opportunity to take it home and place it in various locations in the kitchen to help visualize the look and feel of the finished project. 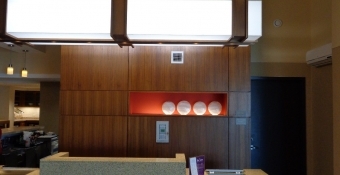 When you have chosen your design, it takes about 2 - 3 weeks for your cabinets to arrive and then our design experts will begin the installation process. A kitchen can be completed in as little as two days, however we can provide a temporary sink and counter top in the event that the process is delayed due to counter top installation. Our installers are capable of handling all plumbing and lighting installations, will remove old cabinets and counter tops, and clean as they go, so there is no need to hire an outside contractor. 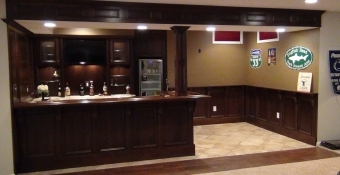 We stand by our work and guarantee that you will be satisfied with the finished result upon completion of the project.